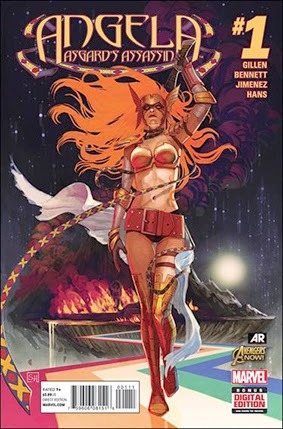 • PLOT SUMMARY: All her life, Angela -- the finest warrior of Heven -- was raised to hate Asgard with every fiber of her being. And now Angela knows the truth about her identity: She is Thor's sister. She is an Asgardian. Cast out of her home and wanting nothing to do with Asgard, Angela must now strike out on her own! But what does Angela have that both Asgard and Heven want? And why are they so eager to get it? Written by Kieron Gillen and Marguerite Bennett. Art by Phil Jimenez and Stephanie Hans. Cover by Stephanie Hans.